Monuments in tribute to the Confederacy are falling. Others extolling Martin Luther King Jr. are rising. It’s not happening in a literal flip-flop on the same spot. Nor are they happening in tandem. But the iconography of the American landscape is changing, however subtly, with political and cultural implications. On the one hand, the notoriety of racially infused violence in such cities as Charleston, South Carolina, and Charlottesville, Virginia, is impugning Confederate monuments. On the other, the approach of the fiftieth anniversary of King’s assassination, on April 4, 1968, is accelerating the perennial momentum to build memorials for him. Exhibit A: in Memphis, where King was killed, the city has honored him at the airport. An historic marker unveiled in May commemorates his final flight. The city is also building a downtown square, dubbed the “I Am A Man Plaza,” recalling the anthem of the sanitation workers’ strike that brought King to Memphis in 1968. And the city is petitioning the Tennessee Historical Commission for authority to dismantle downtown statues of two Confederate titans, General Nathan Bedford Forrest and President Jefferson Davis. There is an urgent push by Mayor Jim Strickland to remove the statues before the whirlwind of events in his city next year that will mark the fiftieth anniversary of King’s assassination. Exhibit B: Mayor Marty Walsh of Boston has announced that the city will honor King by commissioning a statue of King. Just where the statue will stand is a matter still in limbo. But cast in stone is the date of April 4, 2018, the deadline for completing and dedicating it. Gov. Charles Baker of Massachusetts, meanwhile, has ordered the removal of a Confederate memorial on Georges Island in Boston Harbor. The memorial, erected by the United Daughters of the Confederacy in 1963, recognizes the sacrifice of thirteen Confederate soldiers who died in prison on the island during the Civil War. 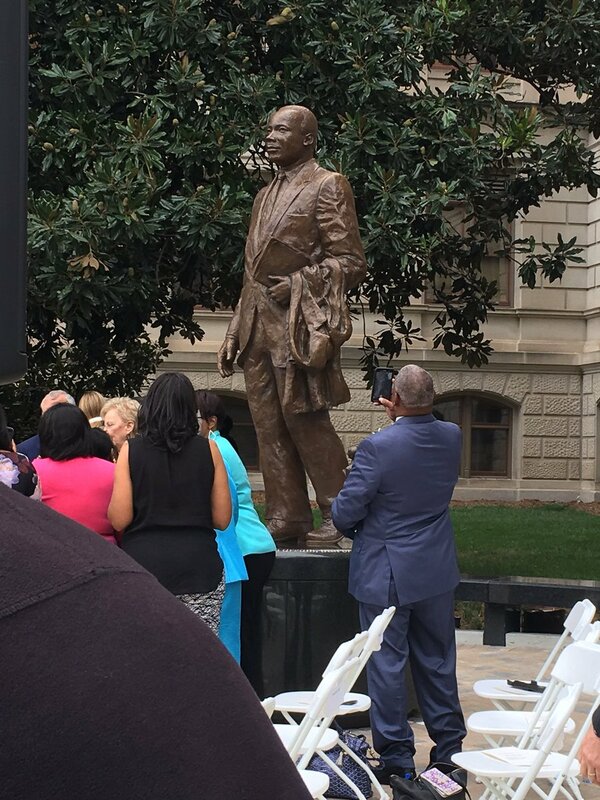 Exhibit C: A statue of King now stands on the Capitol lawn in Atlanta (pictured above). It was unveiled in August of this year. The impetus, which Alabama Gov. Nathan Deal backed, was not the fiftieth anniversary of King’s death. Rather, the statue will commemorate the fifty-fourth anniversary of King’s “I Have A Dream Speech” during the March on Washington on August 28, 1963. Keeping King’s statue in uneasy company on the Capitol grounds are a number of Confederate memorials, including a statue of Confederate general and alleged Ku Klux Klan leader John Brown Gordon. They are not slated for removal, and Deal wants to retain them. But an influential coalition of Atlanta ministers and civil rights leaders is pressuring the governor to change his mind. In a number of other cities, from Baltimore to New Orleans to Los Angeles, Confederate monuments have been scrubbed from public places or are being eyed for removal. A freshly sculpted bronze statue of King depicting him holding hands with Rev. Theodore M. Hesbaugh, the late president of the University of Notre Dame, was dedicated in June of this year in South Bend, Indiana. Boulevards, avenues and streets bearing King’s name, already numbering a total of more than 700 nationwide, continue to be named for him at a steady clip. As recently as October 10, the Johnson City (Tennessee) Planning Board voted to rename a major thoroughfare the Dr. Martin Luther King Jr. Avenue. All of that monument shuffle may produce some unexpected results. The public image of King may vary depending on how sculptors portray him in their work. If the Confederate monuments wind up in museums — as seems likely in some cases — they will be a less provocative and inflammatory, albeit less visible, reminder of the nation’s historic heritage. The ebb and flow of support for Confederate and King memorials can serve as a revealing gauge of the nation’s political pulse. Of course, the monuments are symbols, not sufficient in themselves to remedy the social ills of racism and poverty that King sought to eradicate. Might an undue emphasis on symbols divert public attention from the essence of his unfinished agenda?